Status: ABSOLUTELY STARVING, HUNGRY LIKE NEVER BEFORE! As you can see from the other Friday Posts, it was a really LONG DAY! 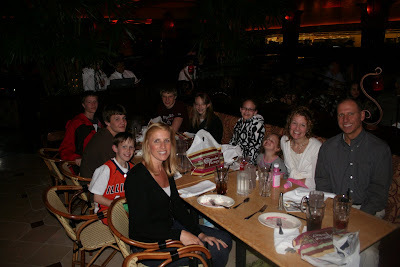 But finally we'd made it to the BEST PART of the whole trip ... getting together at the Cheesecake Factory that night with dear friends from our days of living in the area! Although we'd had the pleasure of seeing two of their three children (center back) when we were there last May, they hadn't seen our kids since maybe 1998? You will really know these are quality people when you realize that they are smiling EVEN THOUGH (although we do not yet realize this) they've already arranged (prior to our arrival) to pay for our whole HUGE meal! ...the "you can have WHATEVER you want" meal I'd bribed the kids down the hill in Arlington Cementary with! I can only IMAGINE what they were thinking while we were ORDERING AWAY...and at the Cheesecake Factory which we only later realized serves HUMONGOUS portions! Not only did they buy our meal Friday night, but we had half a dinner for Saturday night too (see huge doggy bag by Katie)! So thank you dear friends....and again...I am sorry. It was wonderful to see them again. I hope they've recovered financially.